I love the look on people’s faces when I say “South American Jew” It’s like a mix of confusion and sometimes – intrigue. Most times? Pure confusion. Yes, it is possible that people from all around the world can be of different faiths. Including Italians, Indians, Ethiopians, Asians. Etc. If I’m your first “interesting” Jew…well, then, it’s nice to meet you! My mother’s side of the family is from Colombia, South America and my father’s side – Argentina. I mainly grew up surrounded by the Colombian & Jewish cultures, and I am proud of both. Over the years, I became more and more comfortable in my responses and prouder than ever. I know my daughter will get to learn Spanish from an early age, dance Salsa in the kitchen, all while making latkes and playing the dreidel. This year, my birthday is during Chanukah (in Hebrew) Hanukkah (English) and that just means one more reason to celebrate! 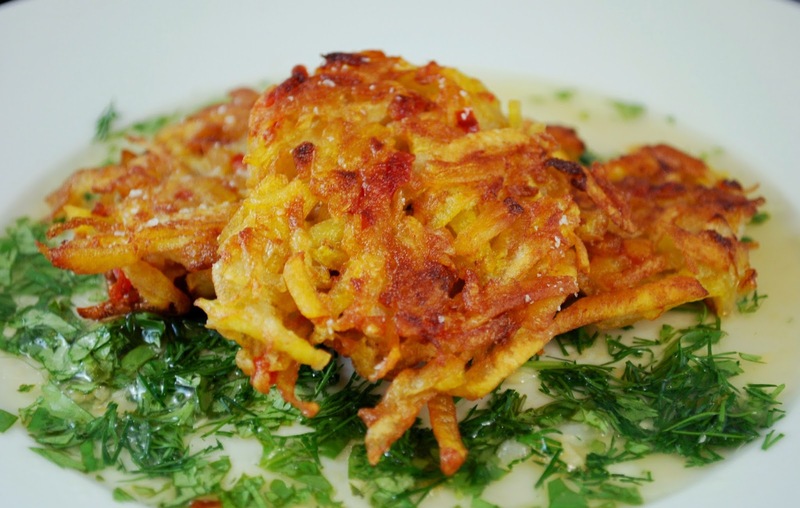 I hope I do dance salsa with my daughter in the kitchen, play the dreidel and make more of these delicious latkes. They are a nod to my South American background and use a non traditional ingredient: Green plantains. For Chanukah – or any time of year, these are a tad sweet, crunchy and delicious when dipped in a garlicky sauce. Mix all together well in a bowl and allow to sit while you make the latkes. 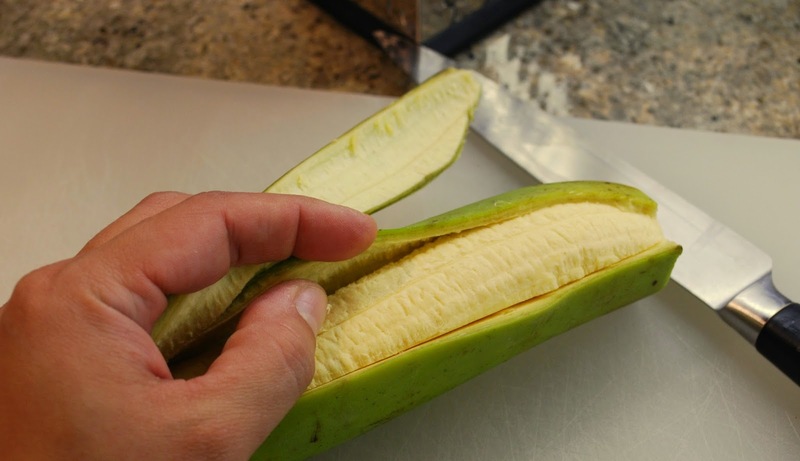 1 Green Plantain, shredded *To peel the plantain, cut a slit down the entire side -shown in the picture above. If it is not very ripe, and difficult to peel this way, you can drop them in boiling water for a few seconds and that should help. Salt, pepper & enough vegetable oil to pan fry. *Start with less than you think. 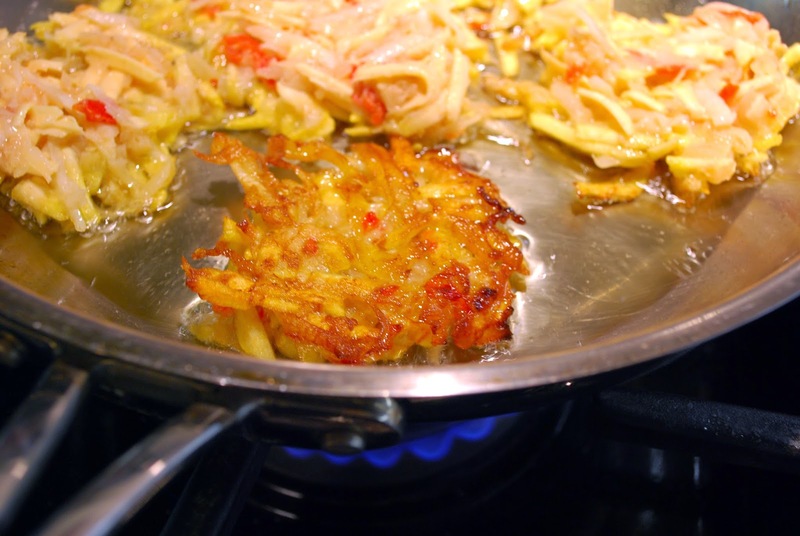 If the latkes are thin, they will crisp up in a small amount of oil and you will get the result without making them soggy. Next, wring out the latke mixture in a kitchen towel, a little bit at a time to remove excess liquid. *this step makes them crispier and they come out better, but they will still be delicious if you skip this step. Just make sure they are thinner, and smaller, so they cook faster. Wow Mamush!!!!! What a brilliant idea!!! This one! Looks delicious and speaks to my Jewish Latin soul! Hope to try it soon! another “Jewlombian” 🙂 These are close to my heart and I am very proud of how they came out! They are not just for Chanukah!